Nomination period begins February 5, 2019 at 10:00am and ends February 26, 2019 at 6:00pm. The Executive Committee and FRC nomination forms can be found here and Board of Directors nomination form can be found here. To be eligible, candidates must submit this nomination form to the GSA office by Monday, February 26, 2019 at 6:00pm. Candidates may submit a nomination form for only one of the listed positions. Completed forms can be emailed to the Chief Returning Officer (CRO) directly at gsacro@mcmaster.ca or dropped in at our office. 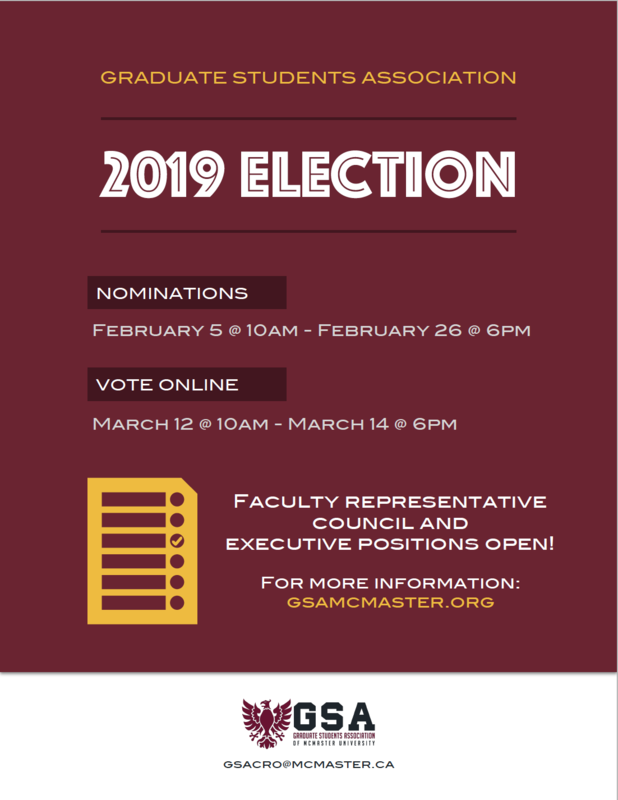 For any questions about the elections, please contact the Chief Returning Officer, Kara Tsang by email at gsacro@mcmaster.ca, or the GSA office at macgsa@mcmaster.ca.